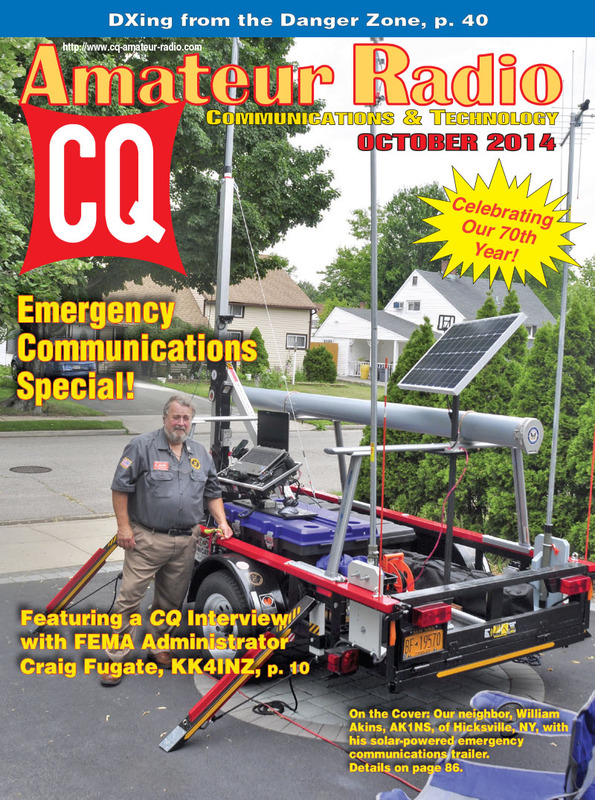 The October issue of CQ is our annual Emergency Communications Special, and this year's edition is anchored by a CQ Interview with the U.S. government's top emergency manager, Federal Emergency Management Agency Administrator Craig Fugate, KK4INZ. The top man at FEMA not only promotes amateur radio as an essential part of disaster planning, but loves kit-building and shortwave listening. Next, Greg Lane, N4KGL,introduces us to RaDAR, or Rapid Deployment Amateur Radio, which is part pedestrian-mobile contest and part emergency preparedness exercise. K1WCC rolls out plans to build a reel for rolling up long runs of coax in the field. It's elegant in its simplicity and utility. Next, we have feedback from our readers on July's editorial about the ARRL's move to de-emphasize the use of the term "emergency communications" in favor of "public service communications." Spoiler alert: most readers who wrote in supported our view that that is not a good idea. Finally among our EmComm Special features, MARS (Military Auxiliary Radio System) members will likely be interested in WA0SPM/AAR8GI's article on building an automatic HF modem switch for quickly changing between the different digital modes that may be in use at any given time on MARS nets. Several of our columns also have an emergency communications focus this month. "Disaster DXing" editor Mehmet Burk writes about radio's vital role in Africa fighting the scourge of ebola; "Emergency Communications" editor KI6SN has plans for a portable 2-meter quad antenna to add "Goliath" strength to your handheld or mobile rig's signal in the field, "CQ World Wide" columnist AA6TS reports on ham radio response to a typhoon in the Philippines and GAREC 2014, the Global Amateur Radio Emergency Communications conference, held this past August in Huntsville, Alabama; and WB6NOA focuses his "Gordo's Short Circuits" column this month on a call for using frequencies and tones, rather than alphanumerics, when assigning operators at public service events and emergency activations, especially those involving hams from more than one organization. 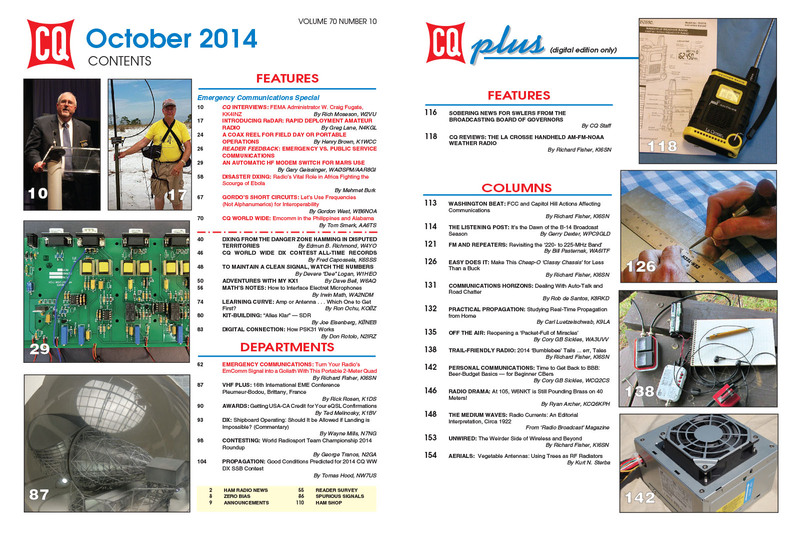 There are plenty of non-EmComm-related articles in this issue of CQ as well. W4YO reports on "DXing from the Danger Zone," a look at disputed territories in the South China Sea and various ham radio activations (or activation attempts) on these islands. We've also got our annual update of all-time records from the CQ World Wide DX Contest (don't forget this year's running - the SSB weekend at the end of October, and the SSB weekend on the fourth weekend in November). Plus, W1HEO discusses the value in keeping track of numbers -- such as SWR curves -- as a way of knowing if something has gone wrong with your station equipment; and W6AQ will entertain QRP enthusiasts in particular with stories of his low-power adventures (and a preview of his just-published book, World's Greatest Hobby). Returning to our columns for October, "Math's Notes" editor Irwin Math, WA2NDM, explains "How to Interface Electret Microphones" and "Learning Curve" editor Ron Ochu, KO0Z, asks the eternal question about improving one's signal: "Which one first? Antenna or amplifier?" Kit-Building Editor Joe Eisenberg, K0NEB, continues his report on his visit to the Friedrichshafen hamfest in Germany with a look at a software-defined radio kit he brought home; "Digital Connection" editor Don Rotolo, N2IRZ, explains how PSK-31 works, and "VHF-Plus" guest columnist Rick Rosen, K1DS, reports on the 16th International EME Conference in France. Awards Editor Ted Melinosky, K1BV, discusses how to get credit for the USA-CA award from contacts confirmed via eQSL; DX Editor Wayne Mills, N7NG, offers a commentary on whether offshore operating should be granted DX award credit in some cases; Contesting Editor George Tranos, N2GA, provides a wrapup of the 2014 World Radiosport Team Championship and interviews two of the WRTC2014 coordinators, Doug Grant, K1DG, and Randy Thompson, K5ZD. Finally in our print edition, Propagation Editor Tomas Hood, NW7US, predicts good conditions for the CQWW SSB contest weekend on October 25-26 and tells us what to expect from the ionosphere overall in the month of October. 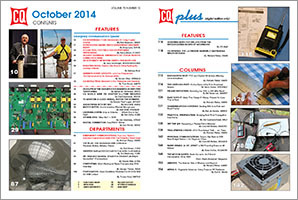 In October’s CQ Plus – the expanded CQ digital edition – SWLing guru Gerry Dexter, WPC9GLD’s Listening Post, has a rundown on the B-14 international broadcast schedule, coming into effect later this month. You’ll also find our Optimum Frequencies chart, compliments of prop expert Tomas Hood, NW7US. At the CQ Plus Propagation Internet landing page are his SWL / Amateur Radio Propagation Predictions for this month. Meanwhile, Practical Propagation columnist Carl Leutzelschwab, K9LA, tells DXers how to determine band conditions from home. CQ Plus Editor Richard Fisher, KI6SN, shows readers in his Easy Does It how to make a “Cheap-o Classy Chassis” from roofing repair aluminum he found at the home improvement store for just 89 cents. Trail-Friendly Radio features the tales of two field operators who took part in the Adventure Radio Society’s “Flight of the Bumblebees” four-hour sprint in late July. See how they successfully competed in this “QRP Field Operator Field Day” of sorts. VHF/UHF enthusiast Bill Pasternak, WA6ITF, remembers the “220-225 MHz” band of the 1970s and ’80s in Southern California. It’s a fascinating look at regional UHF history. In Communications Horizons, Rob de Santos, K8RKD, brings readers up-to-the-moment on emerging technologies for car-to-base and car-to-car communications. It’ll blow your mind. The U.S. Broadcasting Board of Governors’ Special Committee on the Future of Shortwave Broadcasting has some troubling revelations in a recent report to the BBG. We have the details. Yikes! As always, CQ Plus enters the world of the weird and wacky with Unwired – this time leading off with the story of a Texas ham who told authorities he watched as his neighbor threw his transceiver and a drone over a fence. Finally, October’s Washington Beat brings readers up to date on the latest legislation and issues affecting shortwave, VHF / UHF, TV, Internet and amateur radio communications. That's a brief look at what's coming up in the October issue of CQ magazine, available by subscription in both print and digital formats. For information on becoming a CQ subscriber, click here. Coming soon: 2015-2016 CQ Calendars! Order your advance copy now!